Joomla features a Weblinks core function that allows you to create lists of links to external URLs that you can feature in a number of ways on your site. For instance, once you create a category for Weblinks and list the links within that category, you can create a Weblinks Module or menu item that will list either all Weblink categories or all links within one Weblink category. After logging into the back end of your site, go to Components > Weblinks. A category has to exist in order to create a Weblink. Click on the "Category" tab first and inside Weblinks Category Manager you'll notice that there is already one "Uncategorised" Category. 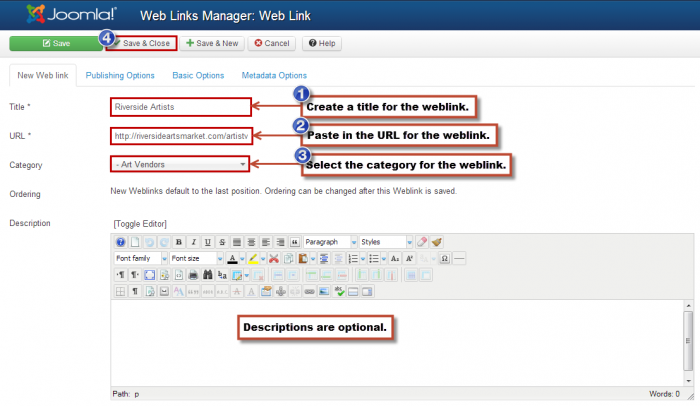 Depending on the number and type of links that you'd like to create, you may not want to create additional categories. If you do feature a lot of different types of links, it's probably smart to create multiple categories. To create a new categories, click on the "New" button in the toolbar. 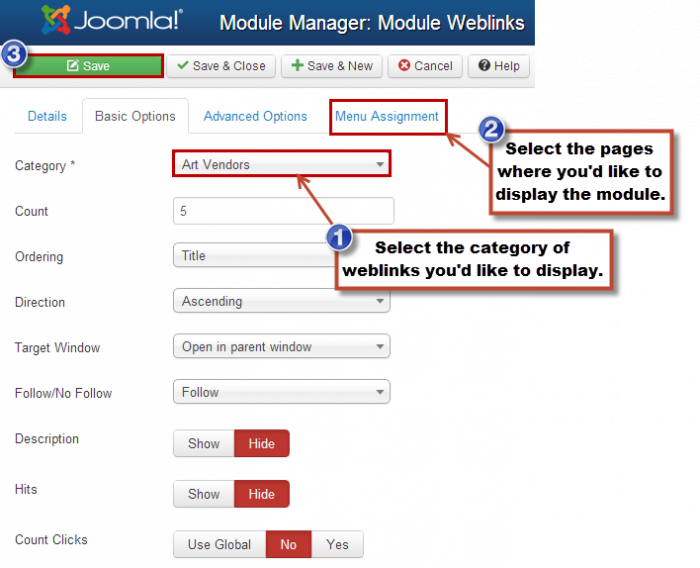 Creating a Weblinks category is much like creating any other type of category in Joomla. The asterisks indicate the required information, and the only piece of required information is a title. There are other useful pieces of information in this area, and you should explore these functions. To create the actual links, click on the "Save & Close" button in the toolbar. After creating categories for your Weblinks, you can create new Weblinks by opening the "Web Links" tab and then clicking on the "New" button. Paying attention to asterisks again, you'll have to create a title, paste in the URL for the link, and then select the category into which you'd like to save the link. Now you can create a Weblinks module or different kinds of menu item types to feature the links. After creating Weblinks categories and Links, go to the Module Manger. The Weblinks module will allow you to display all the links that you created and saved within a specific Weblinks category. Click on the "New" button in the toolbar to create a new module. Select Weblinks from the list of module types that appears. Creating the Weblinks module is similar to creating other types of modules. 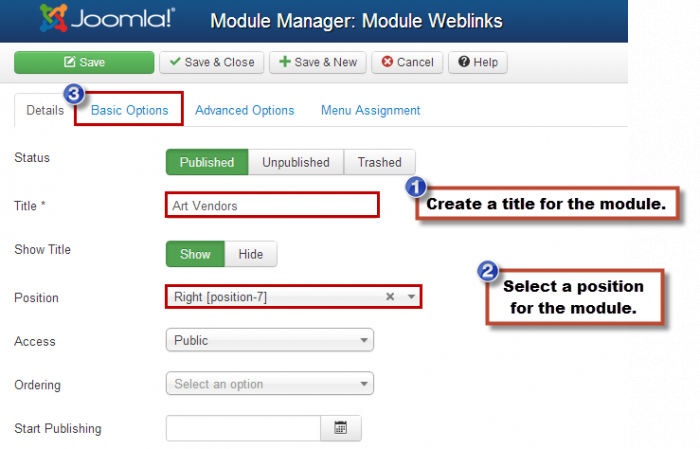 First, in the "Details" area, create a title for the module, and select a position for the module. Then, click on the "Basic Options" tab. In the Basics Options area, select the Weblinks category that you'd like to display in this specific module. In the menu assignment area, you can determine the pages wehre you'd like to feature the module. Be sure to save your work when you're done. After saving the module, return to the front end, refresh the site, and you'll see the Weblinks module.